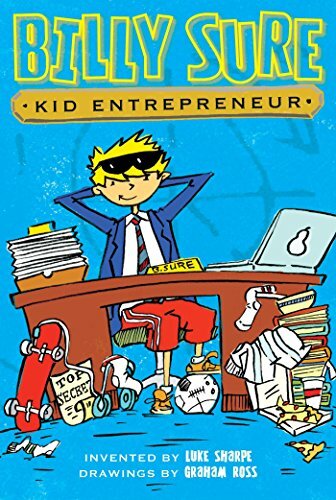 Everyone is talking about Billy Sure, the twelve-year-old CEO of Sure Things, Inc. and genius inventor of the All Ball, a ball that turns into different sports balls with the push of a button. Now Billy wants to help other kids achieve their inventing dreams just like he has! So Billy is hosting an online contest for other kid-inventors to share their inventions, and the winning submission will be produced by his company. Ideas like the Sibling Silencer, No-Wash Socks, and a pencil that does all your work start pouring in. With so many great ideas, how is Billy supposed to pick a winner? And that’s not all. Billy also has to keep the secret that could take him from hero to zero in a flash if anyone found out. Can Billy Sure find a way to stay on top of the world and help other kids achieve their dreams at the same time? Each book in this series includes Billy’s drawings and doodles of inventions and more!